It was a rather sad household that sat down to tea that evening in Lower Rank. Ann Gibbons Pike had just seen her two middle sons off to war – again. Edwin and James were reservists thanks to their previous service, so of course they were the first to be called up as soon as this new war in Europe had started. They had both gone in Eli Goodyear’s cart to Andover station with the others, on their way to the depot in Winchester and then to the front. Edward had been in the 1st Battalion for ten years now, and James had joined him, having been in the 2nd Battalion and the Bedfordshires. What a handsome couple of lads they were, weren’t they, even allowing for a mother’s prejudice? She had given each boy a prayer book with some comforting hymns at the end of the book when they had signed up. It was a comfort to her at least to think this might be of help to them in all the dangers and troubles that they would see. Oh, drat! She had promised herself she would not cry. Ann presumed that her eldest two children, now in London, would be exempt. Sydney was a signalman on the railway, and the Government could hardly send all of them off to war or they would have all the trains in England running into each other. And Mabel’s husband was already forty-six years old – Ann had always tried to steer her away from ‘the older man’, but her daughter’s foibles had now turned into a blessing. Twenty years ago, she and Albert had lived under one roof with their five children and now only she and young Herbert remained. How did the saying go? ‘My son is my son till he finds him a wife, but my daughter is my daughter for the rest of her life.’ Well, it hadn’t worked out like that exactly – she hardly ever saw Mabel, and had only seen her little grand-daughter Edith once, soon after she was born, when Mabel and Alfred came down by train to see her (and Mabel’s friends). But Herbert had not yet found himself a wife, and might never do so. So they would just have to keep each other company in the days and nights to follow. 1. 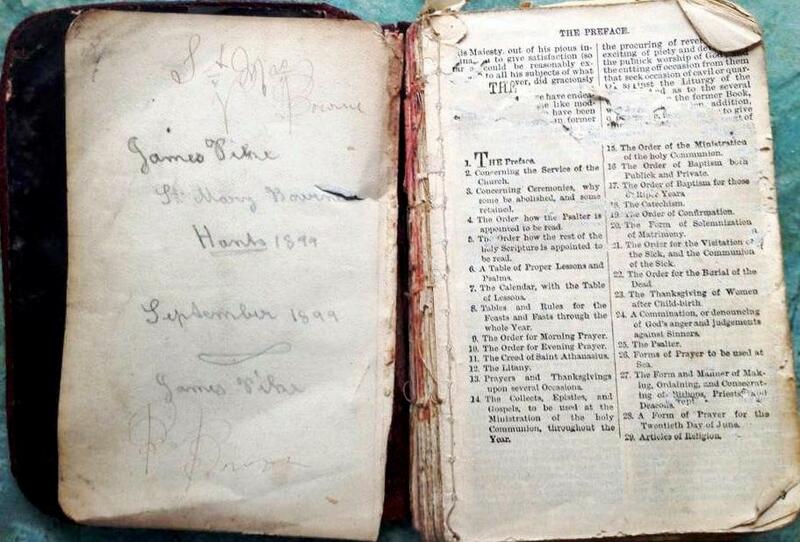 The photograph of James Pike’s bible is shared with the History Group by his family who now live in the house in the Egbury Road that he did. Ann Gibbons Pike, born in St Mary Bourne in 1845, was first and foremost the daughter of George Gibbons, the Parish Clerk, who was the son of William Gibbons, in turn the son of John Gibbons, who had moved to St Mary Bourne from the neighbouring village of Hurstbourne Tarrant some time in the 1770s. She sat at her kitchen table, drinking a glass of parsnip wine, and looked up at the drawing of her as a young woman which had been done by the famous artist Edward Charles Barnes. He had gone on to paint an oil picture based on this, which he had sold, but he had promised her the drawing and she had always loved it. She was the model, but the man was based on no one she knew. He had quite an eye for the ladies, did Mr Barnes, and she was by no means his only model in the village (and everyone agreed that his women were much more lifelike than the men). He and his wife, Mary Anne, came to church from time to time, which is how she had got to know them. The vicar, together with her father, had applied a mixture of pressure and charm with the result that on 24 July 1875 Edward and Mary Ann had had their three children baptised together all on the same day, even though the oldest was seven years old by then! She remembered the skirt she was wearing in the drawing, and having sewn on the border. She was also very proud of her boots, which had been made for her by her cousin Henry, one of the well-to-do Gibbons. It was just after she had sat for this portrait that she had married Albert Pike, on 21 December 1872. In these parts, where farming was the main occupation, it was usual to have weddings around Christmas as the crops were dormant and days were so short that it was convenient to include marriage festivities in the general Yuletide celebrations. Albert her husband could also trace his family back to the 1770s, when his grandfather William was born in the village. She could not say it had been love at first sight, as the families had known each other all their lives. Also, her father had been noticeably sad that, when it came to signing the register, whereas she of course wrote her name without difficulty, Albert could still only sign with his mark (although by that time most people could read and write 1). But he was a good man and if you wanted, as she did, to go on living in the village after marriage, you had to choose a husband from those already there and likely to remain. Then you had to find someone the right age, and single, and Church not Chapel (unless you happened to be Chapel yourself of course) so there were not that many pebbles on the beach from which to pick. The Pike families tended to be larger than the Gibbons, which meant less of everything to pass on from generation to generation. She and Albert had not made that mistake, and she had borne him four sons and a daughter (Sidney, Mabel, Herbert, Edwin and James) and then stopped. They had all lived to adulthood and were doing well. Their eldest, Sydney, had gone to work at the Huntley and Palmer‘s biscuit factory in Reading, where he had lived with Albert’s brother William. Then he moved .up to Wimbledon, working as a railway signalman. 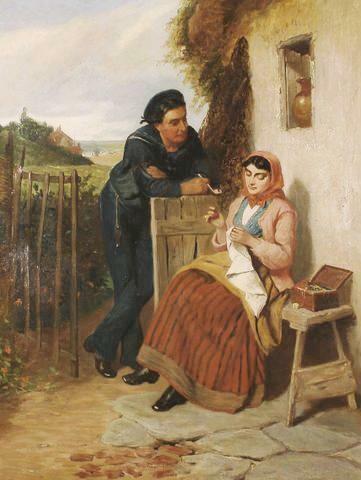 He shared a house with another signalman and his family until he met his wife Ellen, a Surrey girl. And now Sidney had got their second youngest, Edwin, a job as a railway porter and they were living together in Wimbledon. And Mabel? She had gone into service, where she met someone called Alfred Cook, working as a chauffeur. Anyway, she is now Mrs Cook and living in style in a mews house in Porchester Gardens, Bayswater, where they have a little girl. Albert had died in Winchester hospital in 1894, leaving Ann widowed at the age of forty-nine. The next son, Herbert, who was a good and loving boy, had stayed with her and kept her company. He had trained as a wood sawyer, and they could just about manage with the wage that he brought in. Life had had its struggles, and these continued. But she was a survivor, and hoped her nearest and dearest would continue to survive, and even to thrive. Parish clerks should be at least 20 years old, and known to the parson “as a man of honest conversation and sufficient for his reading, writing and competent skill in singing” Canon 91(1603). Functions – reading the lessons and epistles, singing in the choir, giving out the hymns, leading the responses, serving at the altar and other like duties, opening of the church, ringing the bell, digging graves if there be no sexton. The role of Sexton is usually combined in country parishes. They are the sacristan, the keeper of holy things relating to divine service. Responsible for the care of the church, vestments and vessels, keeping the church clean, ringing bells, opening/closing doors, digging graves and care of the churchyard. The south door being the main entrance to the church, has always been the one used for funerals, this has been the reason given for the superstition forbidding its use for a bride who always enters by the small north door. Within living memory a bride, scorning superstition announced her intention of coming into the church by the more impressive south door. At that time there was a sexton in whose family the office had been for generations (George Gibbons parish clerk and sexton for forty years ) and to whom the tradition had been handed down the bride’s determination was met by a resistance so strong that, convinced if she persisted her procession would find a locked door with no key forthcoming. She gave in and used the north door. The information on Ann Gibbons Pike’s family is accurate, drawn from the trade directories, censuses and parish registers. The information about George Gibbons as parish clerk comes from Stevens’ history of the village, and Kevin Holdway’s reading of various documents as he explains on his website, St Mary Bourne Revisited. 1</sup According to the Andover Advertiser of 21st May 1915,James Pike had served for six years in South Africa. The information about the artist Edward Charles Barnes is historically accurate in that he is shown in the directory as living in St Mary Bourne in the 1870s and the scenery of many of his pictures is clearly taken from the Bourne Valley. We do not know, however, the identities of any of his models, still less whether Ann Gibbons Pike ever sat for him.